Bagyong Yolanda will be cyclone Haiyan’s name once it enters the Philippine Area of Responsibility. View the PAGASA weather updates. 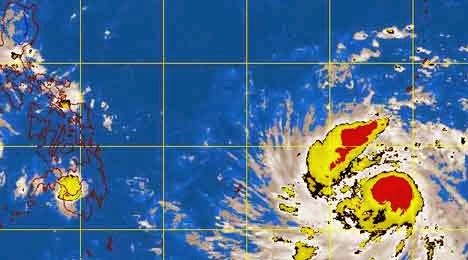 In its 9am bulletin issued Wednesday via social media, the state weather bureau reported that the typhoon was spotted at 1,480 kilometers East of Mindanao. Earlier, PAGASA said it has maximum sustained winds of 120 kilometers per hour and gustiness of up to 150 kph. It is forecast to move West at 30 kph. Bagyong Yolanda is expected to enter the PAR early morning of Thursday, November 7. In a report aired Tuesday night on ABS-CBN’s primetime news program “TV Patrol,” weather forecasters said Yolanda might become a super typhoon like Pablo, which caused massive damage in the provinces of Davao Oriental and Compostela Valley last year. Due to its very wide diameter at 600 kilometers, the feared Super Typhoon Yolanda will probably batter the entire Visayas region including the quake-hit Bohol, and some parts of Luzon, Bicol, and Northern Mindanao. Some provinces could be placed under public storm warning signal number 4. The report said the Office of Civil Defense in Legazpi City is preparing for preemptive evacuation of residents in flood and landslide-prone areas there. Bookmark and visit this site more often for updates on Bagyong Yolanda.